Although only connected to Puerto Vallarta by a good, safe road since early 2007, Talpa de Allende is no stranger to tourism. The town has long been one of Mexico’s most cherished pilgrimage sites. Devout Catholics from coastal Jalisco and Nayarit and from Guadalajara have for centuries walked here to show their devotion to the Virgin of Talpa. 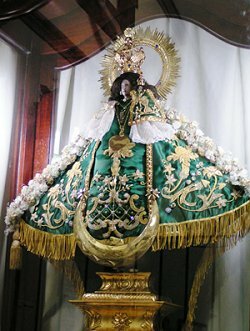 Many attribute with life-changing powers the diminutive representation of Our Lady of the Rosary, or Nuestra Senora del Rosario. The icon is housed in Talpa’s basilica, built in her honor in 1782. Displaying multiple architectural styles from Roman and Gothic to neoclassical, the twin-spired, quarry-stone temple is the soul of this town of about 7,000. The church faces the plaza, which due to the large number of visitors is lively most any day of the year. Professional photographers snap pictures of kids on plastic ponies in front of the church, and a man with a real, live equine that’s even tinier gives squealing tots a ride around the square. After checking out the church and the chapel of Our Lady of Talpa---where the Virgin resides in a glass case---visitors stroll the town center, where shops sell many different types of souvenirs. Typical are rollos de guayaba, a sweet made of cooked and pressed guava. The ubiquitous candy is feted during the town’s Feria de la Guayaba the second week of November. Coffee from the region, both ground or whole bean, is sold in tiny storefronts. Other stores sell homemade, cream-based rompope liquor in a variety of flavors. Small figures from flowers to images of the Virgin are made of chicle, a natural gum. (Yes, this is the original basis for chewing gum.) Tiny wooden chairs and stools are another popular souvenir. Behind the church, La Cruz de Romero scenic lookout provides a view of the neighboring municipality of Mascota, only about half an hour away by car. The lovely forests of the region are characterized by maple, oak and fir trees as well as endemic species like orchids and ferns. Talpa is a great destination for foreign travelers. Accustomed to, and prepared for, tourists, it is still patently Mexican in flavor. For more things to do as well as hotels and restaurants, check out our Talpa Travel Guide.